Conducted by its founder Paavo Järvi this debut release from the Estonian Festival Orchestra, a programme of Shostakovich’s Sixth Symphony and Sinfonietta, marks the centenary of the independence of the Estonian Republic and the orchestra’s European tour. It comes as no surprise that Järvi has chosen to record Shostakovich, a key figure in twentieth century music, as he met him in 1973 when the composer visited his father the conductor Neeme Järvi. Shostakovich, after his alarming denunciation by the Soviet authorities, restored his reputation with his Fifth Symphony. Conscious of continuing his rehabilitation, at first Shostakovich was unsure how to follow its great success and concentrated on other works such as film scores and the Suite No. 2 for Jazz Band. Written in 1939 during the insecurities of an intense phase of Stalinist tyranny the Sixth Symphony is quite a contrast to its predecessor. In it Shostakovich promised he would “express moods of spring, of happiness and youth.” It was Evgeny Mravinsky who introduced the work with the Leningrad Philharmonic Orchestra the same year in Leningrad. Right from the opening bars of the substantial and profound first movement Largo, Järvi’s interpretation evokes a scene of a barren, frozen wasteland together with a spine-chilling sense of desolation. This might reflect the composer’s mental turmoil and pervading sense of peril. In the uplifting central movement Allegro Järvi provides a vivid sense of colour and good-humour rather like a child exploring a toyshop, qualities all set against an undercurrent of tension. Järvi incisively develops the central episode of powerful turmoil. In the Finale the resolutely explosive power growing out of smaller ideas is impressive. A sense of risk-taking is present in the magnificent writing as well as lashings of sardonic wit and the occasional burst of martial character. Rather than a predictably triumphant ending, Shostakovich offers a touch of ambivalence. In Järvi’s engaging reading, despite all the power and passion he remains in steadfast control and the playing feels fresh and precise. Undoubtedly in this Shostakovich masterpiece Paavo Järvi and the Estonian Festival Orchestra are in fine form, but the record catalogue is a crowded field and this account doesn’t overtake the front runners who communicate an additional sense of raw emotional impact. Of my favoured recordings the greatest is the quite riveting 1979 Jesus Christus Kirche, Berlin account from the Berliner Sinfonie-Orchester under Kurt Sanderling on Berlin Classics. Under Bernard Haitink there is also the gripping 1983 Amsterdam account with the Concertgebouw Orchestra on Decca. Praise too for the passionately committed playing of the Royal Liverpool Philharmonic Orchestra under Vasily Petrenko recorded in 2009 for Naxos. Acclaim is also due to Mariss Jansons for his penetrating 2013 account with the Symphonieorchester des Bayerischen Rundfunks, recorded live at Hercules Hall, Munich. Another recent recording, admirable for its profound sense of emotion yet so splendidly controlled, is from Michael Sanderling with the Dresdner Philharmonie recorded in 2015 at Lukaskirche, Dresden on Sony. A standing ovation greeted the 1960 premiere of Shostakovich’s five movement Eighth String Quartet and its popularity has shown no sign of waning since. Written whilst visiting Dresden, East Germany, during the ‘thaw’ years of the Soviet Union the score is dedicated “to the victims of fascism and the war”. In 1961 Shostakovich gave approval for his friend Abram Stasevich to make an arrangement of the Eighth String Quartet which became the Sinfonietta for string orchestra and timpani which Paavo Järvi has recorded here. Stasevich, one of the prominent Soviet conductors of the mid-20th century, often programmed works by Shostakovich. Other arrangements of the Eighth Quartet include Rudolf Barshai’s 1960 transcription for string orchestra known as the Chamber Symphony in C minor, Op. 110a and Boris Giltburg’s solo piano arrangement from 2016. 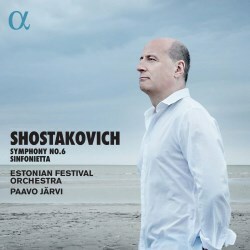 In the Sinfonietta one senses that Järvi is totally at home with Shostakovich’s very personal style of repeated terse motifs, and in communicating the emotional intensity of the writing. In the opening Largo the ominous, rather mysterious sound world generated by the strings is remarkable. The fiercely dramatic Allegro molto makes quite an impact, with its prominent timpani part played by Madis Metsamart. The central movement Allegro sounds like a haunted waltz followed by the second Largo with string playing of searing intensity and some fiercely loud timpani thwacks. The Finale, the third Largo, is austere and desolate as if devoid of any human warmth. Commendation is due for the Sinfonietta a little-heard jewel which sounds outstanding here. In both scores the Estonian Festival Orchestra under Paavo Järvi provide palpable emotional intensity yet there is a freshness of approach and closely observed detail. Recorded at Pärnu Concert Hall, Estonia there is a reasonably wide dynamic range to the sound which is clear and balanced. Written by Paavo Järvi the booklet essay titled ‘The Pärnu Spirit’ is mainly concerned with Pärnu and its Festival but doesn’t provide too much information on the two works. It’s a shame the available space on the album isn’t used for another work maybe the Chamber Symphony for Strings, Op. 49a (Rudolf Barshai's arrangement of the First String Quartet).